In July, we launched Unity 2018.2, which improved the performance of both the Lightweight Render Pipeline (LWRP) and the High Definition Render Pipeline (HDRP) to help you achieve high-end visual quality. The release also included multiple improvements to the Shader Graph, which now supports both pipelines, as well as several new features for mobile, 2D and scripting. We now invite you to get early access to all these enhancements as well as brand new features coming in 2018.3 later this year, including Nested Prefabs, 2D isometric Tilemap functionality and others. This post gives you an overview of the key improvements and information about how to get early access. The 2018.3 beta gives you early access to features that can improve your Prefab workflows, including Nested Prefabs, Prefab Variants and Prefab Mode. The new Prefab workflows allow you to split up scenes and Prefabs on a granular level. They give you greater flexibility, increase your productivity and enable you to work confidently without worrying about making time-consuming errors. The improvements are based on surveys of more than 150 enterprise customers, numerous interviews, several usability tests and two game jams. The long-term goal has been, not only to implement support for nesting, but to rethink the core Prefab workflows, so different team members can simultaneously edit Prefabs confidently and efficiently. Previously, you were forced to choose between creating large monolithic Prefabs, like buildings, or more granular ones, like pieces of furniture, but you couldn’t do both. Now with support for nested Prefabs, a large building can be made up of many smaller room Prefabs, which in turn can be made up of multiple pieces of furniture Prefabs, and so on. As a default, a Prefab Variant inherits the objects and properties of the Prefab it is a variant of, but at the same time, you have the possibility both to override those properties and to add additional components and GameObjects. This is similar to the concept of inheritance in object-oriented programming. For example, if you have a door Prefab, you can create a Variant of it and assign it a different mesh and material to make it look old and broken. Any change made to the base door Prefab will affect the Variant, so, for instance, you can easily tweak the size of the Collider for both doors by changing the base. A cornerstone of the new workflows, Prefab Mode enables you to edit Prefabs in isolation. Being able to edit an entire Prefab Asset without having to instantiate it in the scene or edit an existing instance means you can avoid mistakes related to accidentally applying overrides in the scene that shouldn’t have been applied. This ability to edit in isolation means that you can make your changes with confidence. Head over to our forum to give feedback and exchange information about the new Prefab workflows. The world-building 2D Tilemap tool now enables you to build isometric tilemaps, which makes it easier to create certain kinds of games and to obscure objects. It makes it easy for you to create games such as 2D tycoons and simulation games. The Tilemap renderer is also capable of doing per-tile sorting and optimized dynamic batched rendering. 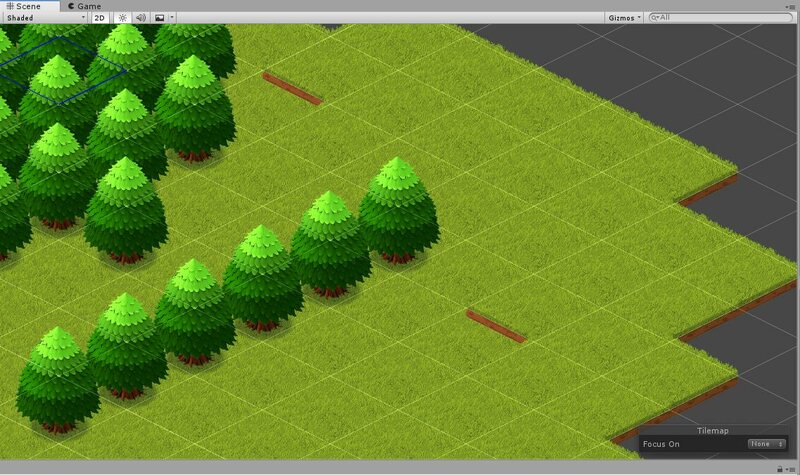 You can use it to create isometric worlds where tiles can obscure objects, so you can make characters go behind buildings, trees and other objects. Another great advantage is that you can paint a tile with a vertical offset. This allows you to create tall structures in an isometric world that are capable of obscuring other objects that go behind it. This feature works well with the “Custom Axis Sort” feature. It is time to remove the Legacy Particle System. We are providing an upgrader on our forums, which will convert legacy components (e.g. ParticleEmitter) into new components (e.g. ParticleSystem). This upgrade should be performed in versions Unity 2018.2 and earlier. Starting with Unity 2018.3, Legacy Particle Components will not work. Unity 2018.3 comes with a number of other improvements and features for Particle Systems. Most notably, our revamp of the External Forces module is ready. It introduces a new Particle System Force Field Component, which can be used to apply a variety of forces to your particles. We’ve also added a Ringbuffer mode, which can be used for persistent effects, such as footprints and bullet holes, and there are two new modes in the Texture Sheet Animation module, for animating particle textures at a fixed frames-per-second or based on their speed. There is also a new option in the Shape module that allows you to emit particles sequentially from the vertices of a mesh, which replicates the Systematic option in the Legacy Particle System. There are a number of other minor improvements coming in 2018.3 too, including a Burst Probability option, per-particle flipping of mesh particles, improved Shape module Gizmos in the Scene View, and the ability to disable the billboard roll, which is particularly useful in VR applications, when the user tilts their head. In our Navigation System, we made sure NavMeshes in prefabs can now be baked in isolation directly from Prefab Mode. Also, we added the NavMeshQuery.Raycast() method to be called in jobs for tracing straight paths between two positions on the NavMesh. We are continuously adding improvements and would love your input in our forums. Other features and improvements include an upgrade of NVIDIA PhysX from 3.3 to 3.4 . The Roslyn compiler is also supported, which allows you to use the latest C# 7 features. In addition, support for Android App Bundles gives optimized APKs to users based on their device configuration. You can get access to everything mentioned above right now simply by downloading our open beta. Not only will you get access to all the new features, you’ll also help us find bugs and release the highest quality software. Join the experts to share insights with experienced members of the Unity community. Win cool prizes — beta testers are automatically entered into our sweepstakes. Influence the future of Unity with surveys, feedback and the chance to be invited to roundtables. Be part of an elite group that gets special benefits, such as discounts and invitations to special events. As a starting point, have a look at this guide to being an effective beta tester to get an overview. If you would like to receive occasional emails with beta news, updates, tips and tricks, please sign up below. As always, refer to the release notes for the full list of new features, improvements, and fixes. You can provide us with feedback for the features on our forums as well. This beta downloads with immediate errors in the MinDrawer class. I wouldn’t have thought such a thing was possible. Can you open a bug report for this, so we can help you? This looks like an issue with your project using an old version of the PostProcessing, but that’s just a guess. Seeing your bug report will give us more info. How long till official 2018.3 launches ? new prefab workflow is great, but i think it would be useful if i can select a prefab in the project view, and the inspector would show the components for the prefab without having to open it in prefab mode. This is the best version update yet! C#7 and nested prefabs are both fantastic. The new editor UI? When? The GPU baker , when? where is the new editor UI design that you announced in unite 2018 Berlin roadmap? Its not listed on roadmap section of site either. It would be much appreciated for http://pakar99.com me and my community. Hi, is anyone else having problems with terrain and grass in the new beta, for me grass is totally invisible, with all settings stating otherwise (I’ve checked them 100 times). At the moment I’m not using a render pipeline asset (because I’m using custom shaders) if that changes anything. Any solutions? Hey – not expected at all, and not something we’ve seen. Would you mind filing a bug (https://unity3d.com/unity/qa/bug-reporting)? It seems that the ShaderGraph works with 2D sprites, but not with UI.Image elements (at least when transparency is at play, which makes the background black). Is this just me, or is it a known issue? And are there plans to make this a feature? Either way, great work on this one. I’ve been waiting for this sort of user-friendly functionality for a long time! As others have noted we see 2018.3 includes new features around Terrain but still don’t see a shader for terrain. Did we just over look it? is it not ready yet? Is it expected in the 2018 cycle? As to the Speed Tree 8 bits, we see the shader for it but checking the Speed Tree web site we don’t see the editor for it e.g. Speed Tree for Unity is still Speed Tree 7. I know this is up to Speed Tree but is there any view from Unity when Speed Tree 8 will be functional and available for use with Unity? Over all looking forward to 2018.3 release and enjoying the beta, would like more information though but that’s always the case. As for SpeedTree8, I’m afraid we don’t have any extra information on that. How switch to C# 7? I upgraded my project but does not seem that I can use it. I see the improved terrain in the beta, but why it not mentioned in the post? Also the new prefab system just great. Oh no! Will you file a bug (https://unity3d.com/unity/qa/bug-reporting)? That’s really not behavior you should be experiencing. What happen to the new input system preview that was suppose to be included in the 2018.3 release, it been like 7 years since you been talking about the new input system. you started two years ago then restarted. what the use of adding so much new feature and not work on the most important feature which is the input system. What about the performance improvement of large worlds with multiple terrains? They planned some terrain improvements in 2018.3, but apparently they moved them into 2019.1 or other future. Unity lacks open-world performant features. We didn’t move terrain improvements to 2019.1 – they’re available as of this beta. We’re working on a blogpost to go into more detail on the improvements. When do you expect Unity for small things to be ready? From the release notes. From one of the recent Unite conferences they said improvements and features to continue into 2019 releases. Added instanced drawing mode reducing the number of drawcalls by about 2 orders of magnitude. We are a small studio called Digams Corps (https://digams.com) setup in Puerte rico, USA. We have gathered resources and are about to start development. Our project requires realistic character animation which will be tedious to setup using Mechanim and conventional statemachine. We would really appreciate if someone at unity can help us out and set us up with a beta or even alpha version of Kinematica. We can provide bug reports for the plugin. We cannot afford any delay to start development. It was mentioned that in 2018.3 the issue with Unity Collaborate where “checking for changes” on startup is a blocking operation would be changed to a non-blocking operation. Is this in this beta release? I’m getting strange sorting behavior (which can be seen here: https://i.imgur.com/8ZtFJx9.jpg ) on isometric tests. All in all this is very exciting, and I’m eager to see what future updates come to 2018.3! is terrain shader expected using HDRP with 2018.3? And is the VFX Editor already available? Terrain + HDRP will hopefully be in one of the next couple betas (or if you’re feeling adventurous you can get it right now by switching to our github version of hdrp: https://github.com/Unity-Technologies/ScriptableRenderPipeline/). More info on VFX Graph, and examples projects will be coming towards the end of October. Sorry about that, it was a typo in the post, which we corrected. It seems like the the Canvas component needs some “Bring to Front” and “Forward/Back” draw order controls because the new prefabs won’t allow reordering of children. Hey folks, where is this “Custom Axis Sort” feature you are talking about? It would be much appreciated for me and my community. Glad to hear you’re enjoying 18.3. The feature you mentioned can be accessed through the Graphics settings menu, found under Edit > Settings > Graphics. It is titled “Transparency Sort Mode”. You can set it to be a Custom Axis, and if you are trying to get Isometric Tilemaps to work correctly, changing it from being Z-sorted to Y-sorted should solve the issue (so 0,1,0 for XYZ respectively). Hope that helps! just update update update update pdate update update update update update update update pdate update update update update update update update pdate update update update update update update update pdate update update i update unity 4 times in a short time .what the hell is going on? When is 2018.3 scheduled to get out of beta ? 2018.3 is scheduled to be released before the end of the year. Hi Unity team. How about that gpu lightmapper, is this coming to .3 as well? As you can see on our public roadmap ( https://unity3d.com/unity/roadmap ) the GPU lightmapper is scheduled to be shipped in Preview mode for 2018.3. We are hoping to have it available in an upcoming beta version. Thanks for the response Charles! Can’t wait! What is the relation between NVIDIA PhysX and Roslyn compiler? Hi Sophie, it looks like there was a problem in our post. We updated the sentence. The PhysX update and the Roslyn compiler are 2 independent features. One question regarding prefab variants. If I have a base class MonoBehaviour, for example Item, and I made a prefab variant out of it. Can I have that prefab variant use an inherited version of the Item MonoBehaviour? There is no mechanism directly related to script inheritance in Prefab Variants, but you can achieve what you describe if you, in the Variant, remove the original component and add the derived component. If you make changes to properties in the original component in the original Prefab they won’t carry over to the equivalent properties in the added component in the Prefab Variant though. Figures since the current prefabs’ serialization seems to not care about inheritance. Reason I asked is so that I can do changes in the base component type by batch (by selecting different prefabs). With this, I think the only way so I can batch edit is to introduce the derived type as an entirely different component. The derive type just sets the delegate or handle events from the base class (which is a bit of work). That or I scrap batch edit and follow your suggestion. Will Unity support this in the future? I believe that this is a more intuitive approach especially for codebase that relies heavily on inheritance. Regardless, the nested prefab is awesome. I would like to do some experiments on it and figure out a new workflow that works for me. The old prefab workflow needs a lot of hacking so this is still a big improvement.